The real story of the Little Mermaid is way more violent and grim than the Disney version, and does not have a happy ending. It's the story of a teenage mermaid who falls in love with a human and makes a deal to get legs, but that's where the similarities end. The original includes bald mermaids, daggers, and a great way to blackmail your kids into being good. If you've ever wanted to know way, way too much detail about a mermaid society, but hate it when your characters have names or plausible motivations, this story is for you. But really, it's very weird, and it makes you wonder why it has not only survived to the modern day, but is incredibly popular and has inspired multiple retellings. In the creature of the week, an ape man you can't hide anything from, but who has an extremely short attention span. I was interested in your comments on Anderssen’s original story. It is one Disney story that really annoys me,as I think by changing the ending, they changed the whole “moral” of the story, which to me is that one shouldn’t try and change who they are in pursuit of love because it never ends well. That’s a modern interpretation, and probably not the one the author intended. IMO, the main difference between classical tales and modern children’s stories is that the classic tales almost always, if not always had a moral or lesson behind them, and weren’t just for children. Perhaps why so many adults still find classis tales, myths and legends so fascinating. I particularly remember Aesop’s Fables, short tales which always had a moral at the core, and which seem to have disappeared from children’s literature recommendations. Most modern children’s books are merely to entertain, or convey a social message, than really about morality. This needs to be remembered when relating to classics and we can’t impose our morality on times sometimes a millenium or more past. I make a point of teaching my children the old stories. The classics do not deny human nature, but do try and teach morals. It’s an important lesson to learn that “evil” is in all of us, as is good, it depends which side we let rule. Thanks for being so open to feedback! I love this story and I was read the original as a child. I love that she fails at the shallow selfish desires of her youth. True the story directs the sympathetic reader to perhaps agree that if she had stayed safe at home safe with her father she may have been more wise. However while in the house of the prince she learns what it is to care for someone else and when given the choice to make a selfish choice the second time she chooses true love and sacrifice. Her goodness is further practiced in the reward of being allowed to care for people for 300 years with the deeper reward of a soul or self love. Thanks for the great tellings! Loved Mulan and the Volsungs.. totally misspelling that. Do you know any stories of the dedannians? Iay be saying it wrong. They are the people who lived in the underworld of Britain. I’d love to hear about them! Hi! Just want to say I really like your podcast, I’ve recently found it and been addicted ever since. I know I’m super late to this comment section but just wanted to say that without even knowing any of HCA backstory I feel like the tale, even though is flawed, could be looked at, the same way as you’ve looking at the other folklore tales. Even though it’s flawed and many times ridiculous, it could be a warning of what not to do, instead of a lesson in what to do, which seems to be the case in a lot of the previous tales I’ve listened to. Also if you take a deeper look at Aladdin it doesn’t look much better. And I feel like I have a bigger issue with Aladdin because in the end it kind of ends up well for him. So it’s kind of like if you’re lazy, don’t work, happen to stumble onto a magic lamp and change your social status and be incredibly rich then you’ll find true love. At least in the little mermaid you can say it not end well for her. Anyway the podcast is great. Keep it up! Do you still have your research or resources from where you found the information on this particular tale? I am sure the original is available online, but I didn’t know if you used multiple sources. I wrote my senior thesis in college on this fairy tale. I worked up an analysis on it, then wrote/directed an original play based on the story. (I tried to fill some of the plot holes and I changed the ending to one that was bittersweet, but not quite as poetically tragic). I learned quite a bit about Andersen’s life that year. 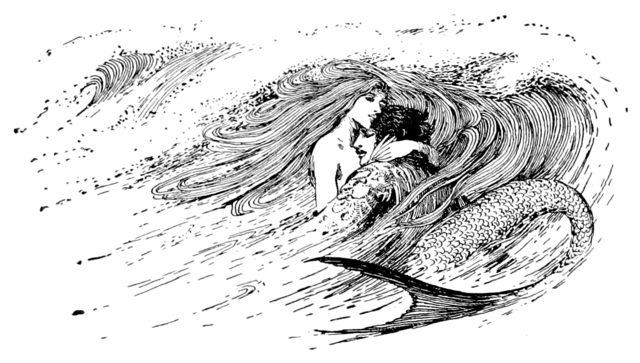 He viewed himself as the mermaid in the story, and felt that his life led him to the conclusion that there is no joy to be found on this earth, but in a land beyond. He wrote this story to symbolize the agony we go through on a daily basis to reach a goal we think we want. I really did enjoy your take on the story, and I agree with many aspects of your assessment…I just have a special place in my heart for this fairy tale, and believe it has merit for our 2016 society. Love your podcast! Just wanted to chime in! I was too hard on this tale. If I did it now, I would give it a different treatment. I hope so. This story is really important to the modern queer community, and given that Andersen himself was gay, the tragedy in this tale takes on a particularly heartbreaking dimension. He would probably often have felt things for “handsome princes” who found his body “ugly”, he was the wrong thing “down below”. Rejection and mistreatment are often themes in his work because being a gay man in the 1800s was an unending clusterf*ck. As a queer girl myself, I found a lot of solace in this story, it’s a very important part of my life. Yes, it’s melodramatic and silly, but there are a lot of themes underneath that have actually very little to do with what little girls need to aim for when finding a man, and more about being seen as something different, even without a soul, and fighting hopelessly in a world that refuses to accept your humanity. I know you wrote this comment over a year ago, but I just started listening to your podcast and I felt the need to tell you that you had missed an incredibly vital dimension to the work. To try to understand HCA’s fairytales outside of his gayness is futile, because it intrinsically shaped them and I formed his world views. I’m really loving this podcast, btw, and have been listening to it while doing my motherly duties and artworks. Being a bit of a mythology and folklore fiend, I knew some of the stories already, but have learnt a lot from your storytelling. Keep it up! Hey, there! A little late here, but I just discovered your podcast and it’s helping work go by quick! Your hate for this story is hilarious. Also, I really appreciated how you pronounced “under da sea” twice. Thanks! I’ve always been a fan of how dark/twisted/ridiculous fairy tales were and find it quite fascinating. Anyhoo, I had looked this story up before and ran into info on Hans Christian Andersen. Apparently, he lived an asexual life but had quite a few unrequited loves, many of them men. Knowing that, it’s pretty easy to see how much of the story of The Little Mermaid could be interpreted as an allegory for having feelings for someone who does not or cannot reciprocate them. Which, at least to me, explains the seemingly unnecessary pain the little mermaid had to endure for acting on her feelings. Just thought I’d chime in on the year-old podcast with this bit of information in case nobody else had 🙂 Thanks again for the fun podcast! I was too hard on that story…I was still new at this, and it’s actually kind of beautiful if you don’t take too critical a look at it. Perspectives like yours and others really helped me understand it a lot better. I normally like your podcast, but if you are going to spend an entire episode commenting on how much you dislike a story while telling it, maybe you could skip that story? Other than that, thanks for a great podcast, especially the norse stories. That’s fair. I did it because I got numerous listener requests for it, and I’ve since eaten my words that it was the worst story ever. I’ve heard some really good interpretations of it from listeners since, and it’s not that bad. The way I presented it was just as my reaction as a reader on how violent/inconsistent/weird the original was, despite it being held up as a great story by modern audiences. I stand by the fact that the original is not a well-written story, but I definitely didn’t hate it. Given that the original is not that well-known, I thought it would be constructive to tell. I think I was at least able to communicate the story to someone who didn’t already know it, even if I did just riff on it the whole time. I’m glad you usually like the podcast though! I love the Norse legends. I’ve studied them academically, and have done a lot of personal reading on the history behind them. i’m sorry, but i disagree. this podcast crystallized exactly why i’ve always loathed that story – even as a little girl, i knew something was seriously wrong and i would get livid when the teacher tried to read it on the Reading Rug. i don’t think Jason or any storyteller has to sit there smiling and nodding and agreeing with every story – that’s what facebook is for. Haha, yes, I think I was a bit too hard on the little mermaid. Ignoring the daughters of the air ending and looking at just the characters, you’re right, it is actually a good story. The character of the little mermaid is tragic, conflicted, and interesting and I wish I would have given that a bit more focus in the podcast.